NASA’s football-stadium-sized, super pressure balloon has seen many ups and downs. The launch of the super pressure balloon had been unsuccessful seven times in the past with the last postponement being because of the bad weather conditions. NASA’s football-stadium-sized, super pressure balloon has seen many ups and downs. The launch of the super pressure balloon had been unsuccessful seven times in the past with the last postponement being because of the bad weather conditions. However, now finally, NASA has successfully launched the super pressure balloon. The balloon was fired up from New Zealand. With the launch of the super pressure balloon, NASA aims to detect cosmic rays from beyond the galaxy as they pierce into the atmosphere of the Earth. The mission has a life of around 100 days during which the balloon will float 33.5 km in the southern hemisphere’s mid-latitude band. “Following our 2015 and 2016 New Zealand missions, we’ve learned key lessons on the balloon design that have gone into perfecting the technology for this year’s flight,” said Debbie Fairbrother, NASA’s Balloon Programme Office chief. “I’m very proud of the team that delivered us to this point and I’m hopeful that third time’s the charm for realising 100 days of flight,” said Fairbrother. The main flight aim is to validate the super pressure balloon technology, while the International Extreme Universe Space Observatory on a Super Pressure Balloon (EUSO-SPB) payload is flying as a mission of opportunity. 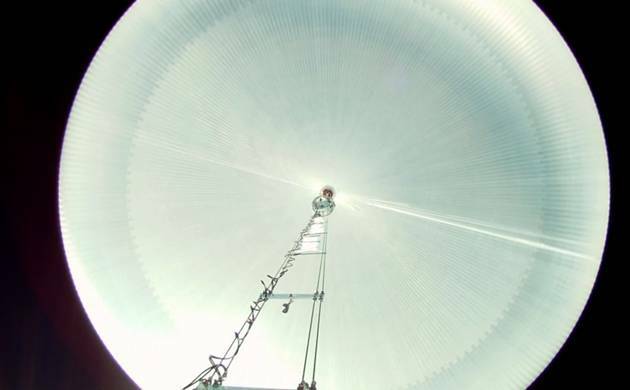 The aim of the Super Pressure Balloon is to detect ultra-high energy cosmic rays from beyond our galaxy as they enter into the Earth’s atmosphere. These high-energy particles after entering the Earth’s atmosphere interact with nitrogen molecules in the air and create a UV fluorescence light. EUSO-SPB will observe a broad swathe of the Earth’s atmosphere to detect the UV fluorescence from these deep space cosmic rays coming in from above. “EUSO-SPB is now searching for the most energetic cosmic particles ever observed,” said Angela V Olinto, professor at the University of Chicago. “The origin of these particles is a great mystery that our pioneering mission will help to solve. Do they come from massive black holes at the centre of galaxies? Tiny, fast-spinning pulsars? Or somewhere else?” Olinto asked. “The international science team is very excited to see our cosmic ray fluorescence detector lifted to suborbital space by this remarkable balloon and departing on this global journey,” said Lawrence Wiencke, professor at the Colorado School of Mines in the US. “This balloon will give us a great view, and we are hoping for a record flight,” Wiencke said. At a relatively low cost, NASA’s heavy-lift balloons have been critical launch vehicles for testing and validating new technologies and science instruments to assure mission success for costlier, higher-risk follow-on spaceflight missions, said Fairbrother. Once the technology is validated, the ultimate goal of the EUSO project is to fly from an even higher altitude on the International Space Station to observe a greater atmospheric area for detecting high-energy cosmic rays. The 18.8-million-cubic-foot (532,000-cubic-meter) Super Pressure Balloon lifted off from NASA’s new launch pad adjacent to Wanaka Airport carrying a suspended payload of 2,495 kilogrammes. As the balloon travels around the Earth, it may be visible from the ground, particularly at sunrise and sunset, to those who live in the southern hemisphere’s mid-latitudes, such as Argentina and South Africa, NASA said. The progress of the flight, which includes a map showing the balloon’s real-time location can be tracked on the NASA website.